In this Mount Eden renovation, the main body of a traditional villa is preserved while two new lean-tos are grafted to its side. The long light-filled, double-height lean-to inserted along the north side of the old villa, transforms the experience of the house. 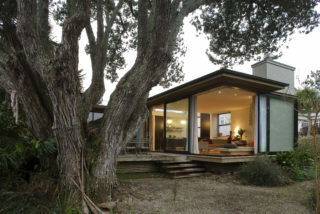 Opening the villa to the double height volume of the lean-to delivers light, warmth and complexity to the living areas. Extensively double-glazed and with an insulated concrete floor, the new volume captures heat from the sun which is utilised throughout the house. Internal gold stained plywood visually reinforces the warming impact of the lean-to, and delineates its crisp form. 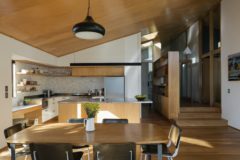 The clients were interested in the NZ house designs of the sixties and seventies, which created interconnected spaces for various family activities. In this case interconnected kitchen, study, dining and living spaces on two levels create an enjoyable internal world while delivering a variety of visual and physical connections to the garden.